It seems that Progressivism is sliding quickly into Satanism. 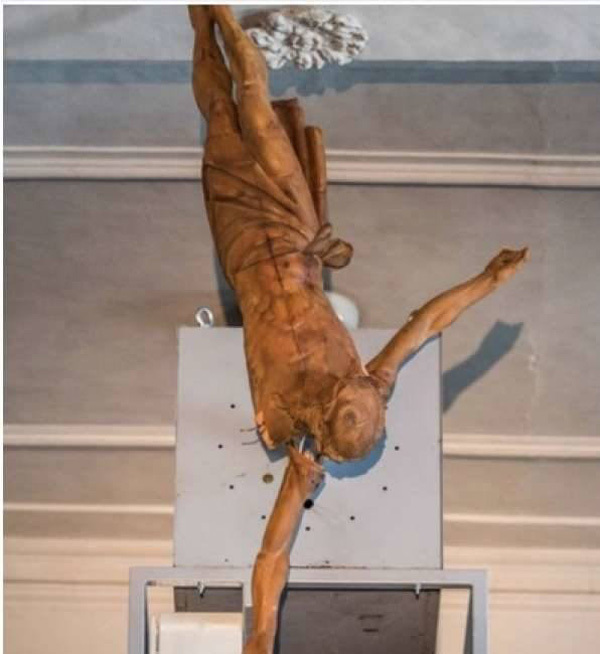 One of the symptoms this is happening is the upside-down Crucifix that the Bishop of Innsbruck, Herman Glettler, ordered to be placed on a back wall of the Spitalkirche, the Hospital Church, in that Austrian city. Glettler gave his full approval to this "art" project featuring works by Manfred Erjautz. He affirmed: "The Cross is neither an arbitrary decoration nor a symbol of power. It must be reviewed and studied in depth. Manfred Erjautz, with his Jesus clock in the church, causes not only new reflections on the Cross, but confronts us with serious questions about the essence of life… As time passes, the arms form different constellations and the static body of the dead Christ suddenly takes life, which represents a moment of liberation from the Cross and an overcoming of death itself." This blah-blah-blah hardly disguises the Satanic meaning of displaying Our Lord Jesus Christ in the back of the Church instead of the front, upside-down instead of right side up, and with his arms grotesquely detached from the body like those of a quartered criminal. In the fourth row below, we post a blasphemous depiction of Our Lord by the rock band Unholy Metal - Frostbitten, which is overtly Satanist. Although the members of the group tried to offend Our Lord Jesus Christ in every way they could, it did not occur to them to detach the arms of Our Lord from His Most Holy Body. It was necessary for a Bishop to propagate this macabre idea. Starting on Ash Wednesday, "Your Personal Jesus" as the piece was named, can be seen Innsbruck Spitalkirche. This name is inspired by a rock song, also blasphemous, whose music video and lyrics depict the band members "finding Jesus" by engaging in fornication with prostitutes. Herman Glettler was made Bishop by Pope Francis in 2017.